The Tropical Rainforest Heritage of Sumatra is a mountainous landscape of exceptional beauty, which forests hold many endangered species including the endemic Sumatran orang-utan. I visited this WHS in September 2018 spending 4 nights in and about the Gunung Leuser National Park in Sumatra Island. After a long and bumpy ride from Medan Airport to Bukit Lawang (and a cheap overnight stay), we left for three days to explore the tropical rainforest of Gunung Leuser NP, camping at different places within the inscribed NP. Our main goal was to admire the Sumatran Orangutans in the wild and we got to see more than a dozen including alpha males, females, young as well as newly born orangutans. The orangutan sanctuary was closed down and the few orangutans kept there were released as the number of orangutans grew enough over the years. We were lucky to spot a female orangutan with her baby around sunset just before she prepared their night nest high up in the trees just above our camping site. Early in the morning, they played together at the small waterfall nearby while we had breakfast which was an unforgettable moment. Apart from the orangutans we also spotted several white handed gibbons, black gibbons, long-tailed macaques, pig-tailed macaques, Thomas' leaf monkeys, silvery lutungs, Sunda slow loris, monitor lizards, jungle peafowls, Salvadori's pheasants, Roll's partridges, Sumatran Laughingthrushes, Sunda Laughingthrushes, Rueck’s Blue-Flycatcher and countless butterflies. Even though the Gunung Leuser NP's size is mindboggling (almost 8000km2), our nature guide was very knowledgeable in tracking and spotting different fauna species (mostly monkeys and primates) but also sun bear claw marks on different trees. Even though it was sunny during our visit, it can get very dark the more you venture inside the tropical rainforest. Luckily we didn't see any Sumatran tigers or leopard cats, nor did we see Sumatran elephants which can be easily seen by adding another day of trekking towards a deeper water source within the NP. Sleeping in the tropical rainforest/jungle was a nightmare, not only because of the close encounters with large venomous spiders, all sorts of creepy crawlers (most impressive of which were the giant ants), a curious baby monitor lizard trying to enter our camp and last but not least noisy long-tailed macaques jumping on our tents. Nevertheless, it was well worth it. The Gunung Leuser National Park is also famous for being the home of the Rafflesia, the biggest flower in the world, as well as the home of the Amorphophallus titanium, the tallest flower in the world. There were rather scary parts to climb up or down the tropical rainforest, so not only sturdy shoes are a must but ideally also walking sticks can be of great help. As of this year there is also a tree top walk just after the NP entrance with the UNESCO logo. At Bukit Lawang there is a tiny visitor centre which is more of an entrance ticket booth but worth visiting for the information boards if you have the time. After three days, we ended our visit with a very fun tubing experience down the river and back to Bukit Lawang. In July 2018, I spent a few days at the Jungle Inn in Bukit Lawang, the gateway to Gunung Leuser National Park, probably the best place to see Sumatran orangutans, where I spent two days hiking in the national park and saw more than a dozen orangutans over both days, ranging from an infant being carried by its mother to a large male. I went to Mt. 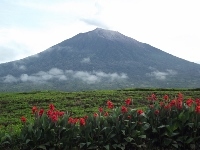 Kerinci as part of Kerinci Seblat National Park, as part of the series of rainforest and mountain range in Sumatra Island in Indonesia. The location is quite far from the closest airport. It is 7-8 hrs drive from Minangkabau International Airport in Padang, West Sumatra. If you are a hiker/mountaineer, it is definitely worth a visit (and hike). Out of all three national parks composing this WHS, perhaps the easiest one to visit is Gunung Leuser on the border of Aceh and North Sumatra Province. Visitors center is in Bohorok, which is located around 3.5 hours by car from Medan airport (from the city of Medan it should take around 3 hours). There are no rental cars available in Medan airport so you either get a taxi or go to the city of Medan and rent a car there. I took a taxi and for a whole day I paid 1.2m INR (around 65-70 EUR). The road is very bad and leads through very populated areas, so drivers must be very careful. I had only 4 hours to stay in Bohorok, so I had to arrange my visit quickly. It is not a problem at all as foreign visitors (quite many for this part of Indonesia) are immediately surrounded by guides. I was offered with 3-hour trekking which costs 35 EUR per person, 3 people minimum. We agreed for 50 EUR for just me, park fee included. Of course I desired to see the main attraction of Gunung Leuser – Sumatran orangutans, but the guide realistically told me that the chances to see them during 3-hour trekking are not higher than 30%. Usually people stay there at least overnight or for a couple of days to maximize the chance to see these apes. The park offers long trekkings with a few nights in the jungle, so the participants may see not only orangutans, but also elephants or even Sumatran rhinoceros. We went for a quite demanding trekking, with lots of climbs and slippery descends. After around 2 hours we saw no apes, all remaining groups passed by were unlucky as well. We were about to go back when my guide saw something brown on the top of distant tree. He started imitating orangutan sounds and crackling a pack of nuts, which he prepared before as a hook. 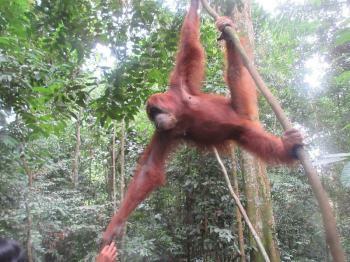 After a while one big female orangutan came to us, followed by her about 2-year-old baby. Although they are undisputedly wild animals, they are quite familiar with tourists, so feeding them was not a problem. There is a rule that you cannot feed the baby if his mother is not eating – it ended with severe beating of the baby and taking away nuts by the mom. We spent with orangutans about 30 minutes in total privacy, so the experience was unforgettable. Based on what I was told by other tourists, it cannot be compared with observing orangutans in Malaysian Borneo, where there are many tourists and few orangutans. It should be noted that previously it was possible to see the orangutans in Bohorok Rehabilitation Center, without going to the jungle, but now the place is closed. Despite external forces of corruption there are still people in Sumatra that are dedicated to halting further encroachment by farmers, loggers and poachers on the remaining areas of tropical rainforest. 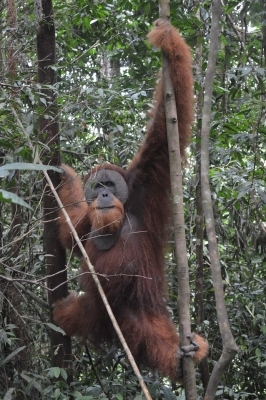 I met rangers in the Gunung Leuser National Park who care for the burgeoning number of orang-utans in their care. This notwithstanding that the forest can no longer sustain the numbers now there, requiring the rangers to supplement their food supply. In the Kerinci Seblat National Park there are similar individuals trying to protect the remaining wildlife and flora, all the time having the forest encroached on by farmers, hunters and loggers. I visited these two National Parks as part of a tour of Sumatra that also took in visits to Berestagi, Lake Toba, Bukittinggi and Padang. This WHS is spread out all over Sumatra. All jungle national parks look the same to me and so to find a reason to check this WHS off your list is to get to Medan in North Sumatra and visit the Bohorok Orangutan rehabilitation center, a two hour drive from Medan. Orangutan babies are collected illegally by killing their mothers. They are then sold as pets. 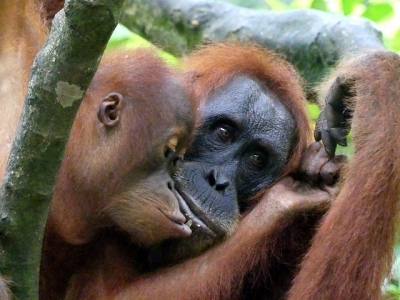 The problem is that when the Orangutans grow up and become unmanageable, they are abandoned. The rehab center is to save these animals and train them to survive in the wild with some supplemental milk and food. Orangutan rehab centers exist also in Borneo but this site is more primitive and so much more natural then others I have visited. I visited this site in August 1994 and also nearby Lake Toba and the native villages around the lake. Bohorok is part of Gunung Leuser National Park. Coffee: Bukit Barisan Selatan NP. "The park has recently lost 20% of its forests to illegal agriculture .... WWF found that more than 450 km2 of park land is being used for growing coffee, and the organisation is now working with multinational coffee companies (including Nestle) to help them avoid buying illegally grown coffee. Sir Stamford Raffles: The Rafflesia Arnoldii produces the largest individual flower on Earth. Its range is limited to the rain forests of Sumatra and Borneo. Wiki states it to be "rare and fairly hard to locate" and "how many of these plants still survive is unknown" The species was "discovered" in 1818 by a botanical expedition in West Sumatra (not within the inscribed area) led by a Thomas Arnold who was lead botanist for the East India company - Raffles was present on the expedition in his then role of Governor-General of Bencoolen on Sumatra. The name given honoured both the finder and his patron. Its presence within the nominated parks is highlighted in the justification under Criteria x.